Replacing the Nissan Stanza in late 1992 was a gamble that paid off and gave birth to something new and fresh. The Nissan Altima debuted in early 1993. When the Altima first appeared, the Altima name plate was displayed in big letters at the rear of the vehicle. The Stanza name still appeared, but it was in small letters aligned to the left on the trunk door. Other unique features included a driver side airbag, which at the time was considered innovative. It also had sporty-like gauges with a higher MPH readout, and it came with a 150 horsepower engine. In its early years, it featured good crash test ratings. Wood trim was available as an option. Today, the legend continues with more technology, innovative and reliability that goes along with one of Nissan’s prized possessions. 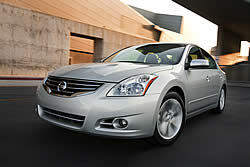 The test car is the 2010 Nissan Altima 3.5 SR V6. This year some changes were made, especially with the branding. Instead of the 3.5 SE it is now 3.5 SR, which is the top of the line model for the Altima. Another change is the exterior appearance. The grille has been restyled, giving it more appeal. The front bumper was also restyled while the rear bumper remains the same. The headlight arrangements have also been changed and widened. The performance of the vehicle is impressive, boasting a 3.5 liter 24 valve 6-cylinder engine with 258ft. lb torque. The test car accelerated from 0-60 in 6.7 seconds, which is thanks to the 270 horsepower engine that propels the vehicle forward at rocket speeds. Torque is what gives the vehicle better off the line acceleration, while horsepower is how fast it takes the vehicle to get to speed. The Altima 3.5 SR CVT transmission is equipped, with a shiftless transmission that eliminates shift shock and provides seamless acceleration and goes nicely with the manumatic mode. The manumatic mode gives the consumer more control by allowing the driver to shift gears like a manual transmission without the clutch. The engine, despite having 6 cylinders manages to receive a respectable fuel economy rating 27 MPG highway. On the road the Altima 3.5 SR handled well despite there being some body roll present at higher speeds when cornering, but overall it handled with no problem– even on icy roads. What contributes to the Altima’s smooth ride is the suspension. It is equipped with front and rear stabilizer bars, independent front suspension, and independent multi-link rear suspension. All four 17-inch rubber tires with alloy wheels were glued to the road, thanks to the vehicle dynamic control and traction control. The brakes are power assisted with front and rear ventilated disc brakes. Just as impressive as the suspension and overall ride, the Altima 3.5 SR has numerous safety features to put the consumers at ease. Nissan features an advanced airbag system, including side-impact supplemental airbags, roof mounted curtain side and impact supplemental airbags. It also has anti-lock brakes, tire pressure monitoring system, — which insures that your tires are always properly inflated, — vehicle security system and more. This vehicle is also not lacking when it comes to storage. The trunk was a nice size with ample room for suitcases and large items. The rear seats can fold flat allowing for even more room. The front seats were very comfortable. The front driver seat is equipped with an 8-way power adjustable seat that is easy to operate. However, the one thing I did not like about the seats was the styling. The test car I drove did not have leather seats. However, I found the choice of cloth seat selection limited. The front seats offered lots of leg and back support. The rear seats also had good back support and headroom., but not much space for legroom and that is with the front seat moved forward. The knee room is just not enough, to accommodate someone with really long legs, which might be as they might anticipate being somewhat uncomfortable during a long road trip. Other features on the Altima 3.5 SR include the intelligent key that goes along with the push button start. The intelligent key is a devise that does not require you to take the key out of your pocket to start the vehicle. This same key allows the consumer to unlock the trunk, and in the hot days of summer, will allow you to roll the windows down without being in the car. Bluetooth technology is also available, a hands free devise that allows you to use the telephone without you taking your eyes off the road. A leather wrapped steering wheel with audio controls is available. On the Altima 3.5 SR is also a sunroof. The test car had the 6-speaker audio system, but another option is the Bose audio system that offers maximum surround sound and ultimate clarity for those that like entertainment and music. Speaking of entertainment, the Altima 3.5 SR comes with an optional satellite radio. A navigation system is also a feature that will help you find your destination in the event that you lose your way. Some interesting features on the Altima 3.5 SR is the UV solar reducing glass, the auto on/auto off headlights, heated mirrors so you don’t have to worry about fog building up on the mirrors. Overall, this vehicle has a lot to offer from the fuel economy to the exterior styling, to the interior design, this vehicle has a good track record and according to Nissan, it is one of their most reliable cars. When Is A Violent Song Just A Song?